Paying tribute to an old fashioned deli masterpiece. One of the simplest, most familiar, sandwiches is pastrami on rye, and for many, it is the king of all sandwiches. Foolproof, this rich silky, garlicky, peppery and piled sky-high pastrami needs no bells or whistles. The magic happens, when crafting the meat– curing, spicing, crusting, smoking and steaming. Then, all that is needed is soft chewy seeded rye, one that has some sourness to it, along with a dusting of cornmeal on the bread’s surface. The bread must be warm (a must) and is the perfect vehicle to add a heaping helping of Modern’s Stout Mustard, which never disappoints. So curate high-quality meat or make your own. This iconic sandwich is as straight-forward as it gets, but provides a taste that you remember and want over and over, keeping you coming back for more. I could not blog about pastrami without mentioning my favorite place in the world to have this sandwich, and it is not even in NYC. For me, Langer’s in LA, downtown LA no less, is truly the very best. It is a pastrami mecca, and the pastrami sandwich is taken very seriously at this landmark restaurant. So, if you are ever in Los Angles, this is a must-have sandwich. Place pastrami in a skillet over medium high heat. Cook until fat of pastrami starts to steam, cover with two slices of rye bread. 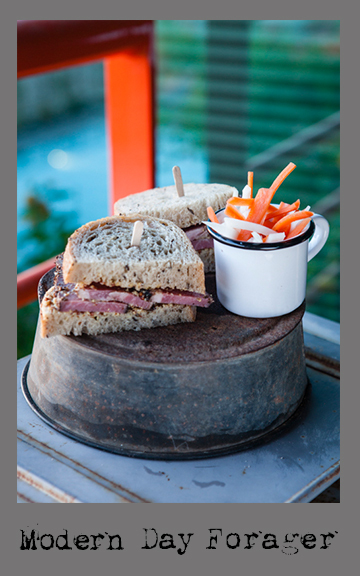 Steam bread to warm, remove bread, flip over pastrami. Cover with remaining rye bread and steam. On your work surface, place 2 slices of steamed rye bread and spread each with 1 tablespoon MDF Stout Mustard. Layer each bread slice with 6 oz. thick cut pastrami; place two remaining slices of bread on top of pastrami. 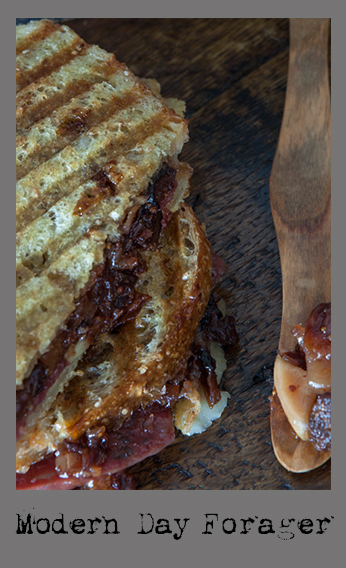 Layer pastrami, sautéed onions and Thousand Island dressing on rye bread. In pot large enough to hold brisket, combine 1 gallon/4 liters of water with kosher salt, sugar, sodium nitrite (if using), garlic and 2 tablespoons pickling spice. Bring to a simmer, stirring until salt and sugar are dissolved. Remove from heat and let cool to room temperature, then refrigerate until chilled. Place brisket in brine, weighted with a plate to keep it submerged; cover. Refrigerate for 2 days if it’s thin, a third day if it’s thick. Remove brisket from brine and rinse thoroughly. Refrigerate it for another day uncovered (this is best, to let cure equalize, but if you can’t wait, that’s ok too). Combine the pepper and coriander and coat the brisket with it. Smoke and cook the brisket, till tender, as described above. Slice thinly to serve. This will keep for a week in the refrigerated. Steam it to reheat or reheat covered in a microwave (gently). Place peppercorns and coriander seeds in a grinder and grind until coarsely chopped. Mix the salt, sugar, garlic, and ginger with the seasonings from the grinder. Reserve 1/4 of the seasonings. Rub the flat thoroughly on all sides with seasonings. Wrap in plastic wrap, then aluminum foil. Place in a glass pan in the refrigerator. Turn daily for at least one week, up to two weeks is better. Remove brisket from all wrappings. Place on rack in pan so it can drain, and put uncovered in refrigerator overnight, until very dry. Remove from smoker and place in a large dutch oven. Cover with beef stock, beer and water. Add the reserved rub, the pickling spice, the bay leaves, the additional juniper berries, and the additional black peppercorns. Simmer covered until tender about 3 hours. 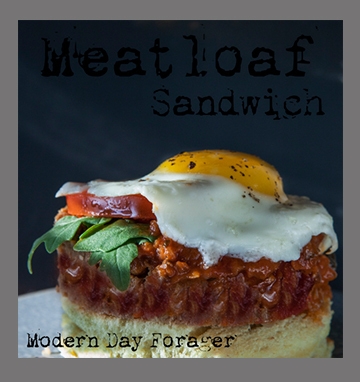 One of the best feel-good foods is our next go-to sandwich, the humble old fashioned meatloaf sandwich. We would venture to guess, that just about every family has a recipe that has been handed down from generation to generation of this down-home classic. With so many variations, this American staple may be customized to your liking, there are so many choices, such as the addition of oatmeal, crumbled cheese, hard-boiled egg, and even a blanket of bacon to keep the loaf moist, flavorful and tender, the options are endless. Our mighty meatloaf is open-faced, packed with high-quality meat, our MDF ketchup, a rustic toasted roll, and if that wasn’t enough, we have crowned it with a fried egg. It couldn’t be more comforting or satisfying. The secret to making this recipe, is to keep the mixing and handling to a minimum, keeping the loaf moist and tender. Our tasty tangy ketchup adds to the moistness and the concentrated flavor is hearty, thick and chunky. Next, we added crisp peppery rocket leaves and juicy ripe heirloom tomatoes for a pop of freshness. Then a farmer’s egg, which just takes it over the top, the runny yellow yolk, for us, makes it our ultimate comfort food. The prep to plate for this tried-and-true classic takes no time at all and is worth making over and over. Adding this recipe to your collection is a must. Butter bottom of roll and place butter side down on a griddle or medium heat skillet to toast. Brown meat loaf slice on both sides in 1 teaspoon of olive oil in skillet or on griddle until heated through. Fry sunny side up egg. Place meatloaf slice on toasted bread, top with MDF ketchup to taste then add tomato and rocket leaves. Fried onions, cheddar cheese, Monterey jack cheese, pepper jack cheese, sliced jalapenos, dill pickles, or bread and butter pickles. In a large bowl, mix onion, garlic, Worcestershire and bread crumbs together. Combine ground meats with breadcrumb mixture. Season the meat mixture with salt and pepper. Add the egg and milk combine thoroughly, but don’t over work the meat. Use a greased loaf pan as your mold, (or use your hands to free form) fill it, lightly packing then turn the meatloaf out onto a lined baking sheet. Bake for approximately 90 minutes, glazing after 10 minutes, 30 minutes and 60 minutes. Until the internal temperature is 160 degrees F and the meat loaf is cooked through. Once cooked, remove from the oven and let it cool, about 90 minutes. Combine all the ingredients in a small bowl and spoon over the meatloaf after 10 minutes cooking time and again after 30 minutes and again at 60 minutes. There is so much more to making a sandwich than slapping all sorts of ingredients between two slices of bread. This week, we will take the sandwich and elevate this portable package to new heights. Is there an art and a formula to making a great sandwich? We sure think so. With attention to detail, carefully sourced ingredients, and a little extra time, you can make an unbeatable sandwich. First, it all starts with the bread… should it be crusty, crispy or chewy? The bread is the blank slate, the perfect landscape, think about your ingredients, are they right for your bread, you don’t want a soggy vessel. Look for hearty, healthy, local artisanal bread with texture. Next, choose high quality protein and fresh, local produce. Add vegetables such as cucumbers for an extra crispness then try apples or pears for added sweetness and crunch. Finally don’t forget to spread on the house made condiments, which are easy to make and you control what goes in your spreadable. Great bread, great ingredients, well-thought out flavors, textures and combinations equal a great sandwich. 3. Slice on bias against the grain about 1/2 inch thick. 4. 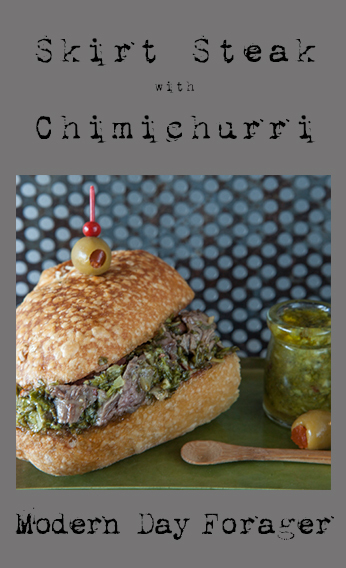 Shingle on bread and top with more chimichurri. 5. Serve with more chimichurri as a dip. For a great side dish toss chimichurri sauce on potato wedges and roast in 400°F oven until just tender, about 40 minutes. On one piece of bread, spread the mustarda in an even layer. Fan the salumi slices over mustarda. Lay the cheese on top of the salumi. Top with another slice of bread. Spread 1/2 teaspoon butter on the top slice of bread. *Repeat this for the remaining three sandwiches. Heat for 5-6 minutes until golden brown and the cheese begins to melt. Using a spatula, flip the sandwich to the other side for another 3-4 minutes until golden brown and the cheese is completely melted. This cherished (Sicilian) Italian condiment has many faces, made with fruit, (fresh, dried or candied) sugary syrup, wine and the essence of mustard, it is quite versatile. The specialty dish, Bollito Mistro in northern Italy, traditionally served mustarda along side this hearty stew (similar to the French Pot-au-feu) as a celebration dish in the fall and winter. It has gained popularity and made its way as an accompaniment on charcuterie, crusty breads, cheese boards, spooned over creamy polenta and it is equally delicious, crowned on poultry, game and fish. It even adds a depth of savory piquancy and sweet flavor as a quick pan sauce or poured over ice cream. 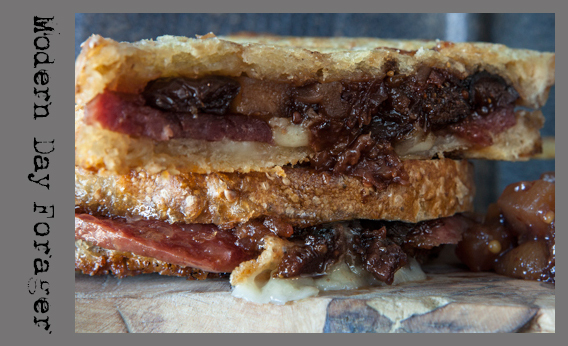 Our favorite way to enjoy mostarda is to add it to a grilled salami and gruyere cheese sandwich, the mostarda just adds a richness and a spicy-sugary balance to the saltiness of the cheese and salami. Yum! 1. Place the dried fruits, shallot, ginger, wine and honey in a medium saucepan and simmer for 10 minutes. 3. Season with red pepper flake, salt and freshly ground black pepper. 4. We like our mustarda chunky here at MDF but if you prefer a thinner consistency you can puree part half the mixture and then mix for a medium chunk or puree the entire batch for a jam like consistency. 5. 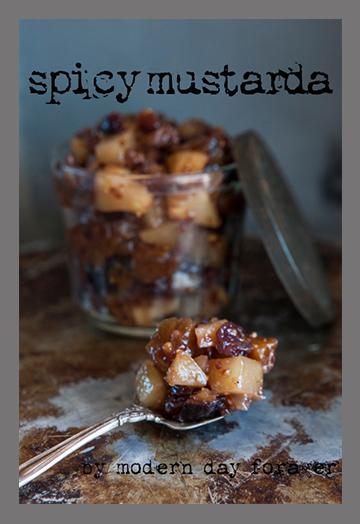 Let the mustarda cool, place in a sealed container and store in the refrigerator. 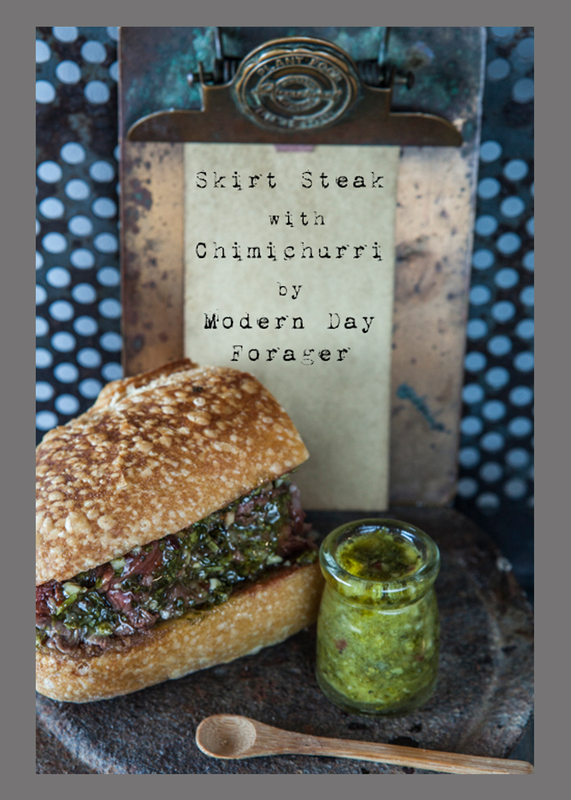 This acclaimed quintessential Argentinean sauce, chimichurri compliments grilled meats perfectly and is a crowd pleaser you should try for your next summertime gathering. This fairly spicy sauce is bright, fresh and herbaceous with a garlicky, tangy punch. Made of parsley, oregano, garlic, shallots, vinegar, fresh lemon juice, red pepper flakes, and olive oil, this sauce really needs time to meld all of the flavors together, so make a day or two ahead of time, before you serve it. Not only can you present this table side but if you don’t have the extra time to make it ahead, it also makes a easy and quick (that day) marinade for vegetable kabobs, beef, lamb, poultry, fish and will really pop and heighten the flavor. 1. 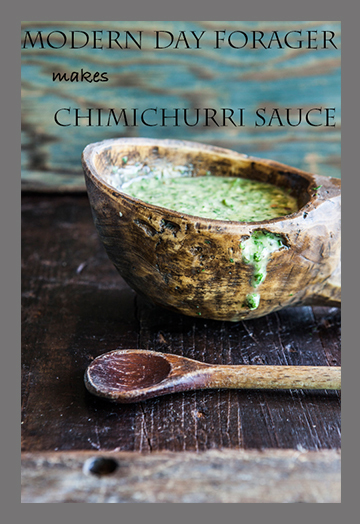 Place all chimichurri sauce ingredients in a blender or food processor and pulse until well chopped, but not pureed. 2. Store in an airtight container in the refrigerator. Plus it makes an incredible cheeseburger topping. Try adding it to soups, stews and rice dishes, as well. We all know that ketchup and mustard are the king and queen reigning the condiment world, while we know there is something nostalgic about commercial brands, don’t leave it in the hands of Heinz and French’s. Embrace making your own handcrafted customized concoctions. Making ketchup is really quiet simple, and the flavor combinations are endless. So why not? If you have an abundance of tomatoes from your garden this summer, why not use these juicy orbs of goodness and build a better ketchup? Place the first 12 ingredients in a large pot over a medium-low heat for 15 minutes stirring often. Add the tomatoes and 1 1/2 cups of water. Turn heat to medium-high stirring often, until liquid is reduced by half. Pour mixture into a food processor and process until smooth, then pour mixture through a mesh sieve into a clean pot. Over medium heat stir in red wine vinegar and brown sugar, and reduce to the thickness you desire. Cool and then store in refrigerator. If you prefer a chunky style, just omit the sieve step. Don’t hold the mustard or cut the mustard, make mustard! This top dog condiment is surprisingly a cinch to make. However, there are a few basics you need to understand about the process for making really good quality mustard. First, the seeds need a good crushing and grind, and the key here is to add cold liquid (cold stout in this recipe) to add moisture to the mustard seeds. Mustard gets its bite when the cracked seeds release volatile oils, much like capsaicin, the “hot” in chile peppers and when mixed with the liquid, the result is pungent and spicy. Second, heat will temper the chemical reaction (much like cutting a onion) so, hot mustard, cold liquid, warmer liquid a more mellow mustard. Also, in addition of the cold liquid remember that adding an acid is crucial to the recipe. If you don’t add the acid, the mustard will lose its bite over time. Adding vinegar, for instance, will stop and set the chemical reaction in place. Mustard is extremely versatile, with many variations, it livens up and pairs well with sandwiches, cold meats, cheese, greens, burgers and hotdogs. Rj and I are from Chicago and the only way to eat a dog is with mustard, sorry ketchup. It also is a great emulsifying agent/stablizer for salad dressings, marinades, dips, sauces and spreads. By making your own, you avoid all the goop of artificial flavors, fillers, colors and homemade just tastes better. Combine all of the ingredients in a large mason jar, cover and refrigerate overnight. Store in your refrigerator, for up to 2 weeks. We are back from our much needed break and we are raring to go and just over the moon to get back to our beloved blog. 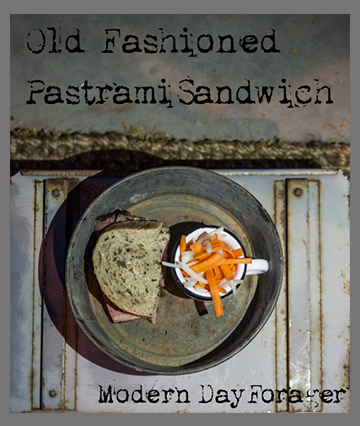 This week it is all about MDF’S favorite condiments and ramping up the flavor. Today, people have become much more sophisticated with their food choices, then in the past. We are willing to experiment, taste new flavors and learn about new cultures. Usually, it starts with condiments that have gone mainstream. So, we want to DIY our condiments. Why? Well, most of the so-called jars of goodness, we buy, are filled with all sorts of preservatives, chemicals, fillers, binders and high fructose corn syrup. Making a small batch from scratch is a much healthier and tastier way to go. 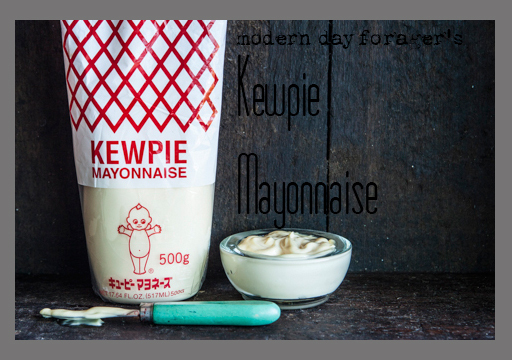 First up, is our take on Kewpie Mayonnaise, the name alone makes for a great conversation. This Japanese mayo with the kewpie baby doll on the bottle is quite popular among big time foodies, this is our version without the addition of crystallized monosodium glutamate. What is interesting about this mayo that differs from homemade and industrial mayo, made here in the states, is that, only egg yolks are used and mainly rice wine vinegar or some other type of vinegar is used to replace the lemon juice. The end result is a yellowy, creamy, rich, thick, eggy mayo with a smooth luxurious mouth feel that is quite satisfying. You have never tasted a mayo like this, and once you do, you’ll wonder how you ever got by without it. Flavor-packed, this condiment is wonderful on deviled eggs, burgers, sandwiches, dressings, dips, spreads, in egg, chicken and tuna salads and amps up just about everything you put it on or in. It is also used as a umami flavor in many restaurants across the country and is a secret ingredient among many chefs. 1. Place the egg yolks in the bowl of the food processor, add the vinegar and mustard, season with dashi powder, salt and sugar to taste. Turn the machine on and VERY slowly start to drizzle in the oil until the mixture starts to look like mayonnaise, then a slow steady stream of oil can be added. 2. Put in the refrigerator for at least an hour to let the flavor develop. Note: If the mayonnaise is too thick add a few drops of water or if it is not thick enough, with the machine running, add a little more oil. , 1/2 cup Kewpie mayonnaise, 1 tablespoon Sriracha, 1 small garlic clove (smashed to a paste), 1 teaspoon sugar. Preheat broiler on high heat. Remove one half of mussel shell and discard. Whisk together mayonnaise, Sriracha, garlic, and sugar, then place about 1 teaspoon over each mussel. Place mussels on a foil-lined baking sheet. Broil 4 to 5 inches from heat until sauce is bubbling and begins to brown, 6 to 8 minutes. Mix yolks with kewpie mayo, minced habanero and freshly ground black pepper. 2 tablespoons kewpie mayo and a squeeze of wasabi paste to taste, mix. Hints of old fashioned sensibilities but couldn’t be more modern, is our take on kimchi. Kimchi or sometimes called gimchi is a traditional side dish or topping made of spicy fermented vegetables. Kimchi is a staple in Korean households and comes in many types and varieties, but the most common are made with cabbage, cucumbers, radish and green onions. We decided to get our kimchi fix on by making kimchi relish which is chopped finer then traditional chunky kimchi. We added agave nectar, rice wine vinegar and Sriracha, which gave a slight sweetness and a spicy kick at the same time and just tastes darn good. This crispy relish works well on burgers , hotdogs, tacos, sandwiches, in soups or stews and on steamed rice or noodles. It will stand up beautifully to any steak or add a real punch to a bland chicken dish. If sunny California is in your near future or on your bucket list, try Kogi BBQ, the famous LA Korean taco food truck. They do a kimchi quesadilla that will just knock your socks off. We love David Chang’s recipe, so we went with his kimchi. Combine kimichi, agave, vinegar and Sriracha in a medium bowl, season with salt and pepper to taste and serve. Cut the cabbage lengthwise in half, then cut the halves crosswise into 1-inch-wide pieces. Toss the cabbage with the salt and 2 tablespoons of the sugar in a bowl. Let sit overnight in the refrigerator. Combine the garlic, ginger, chile powder, fish sauce, soy sauce, shrimp, and remaining ½ cup sugar in a large bowl. 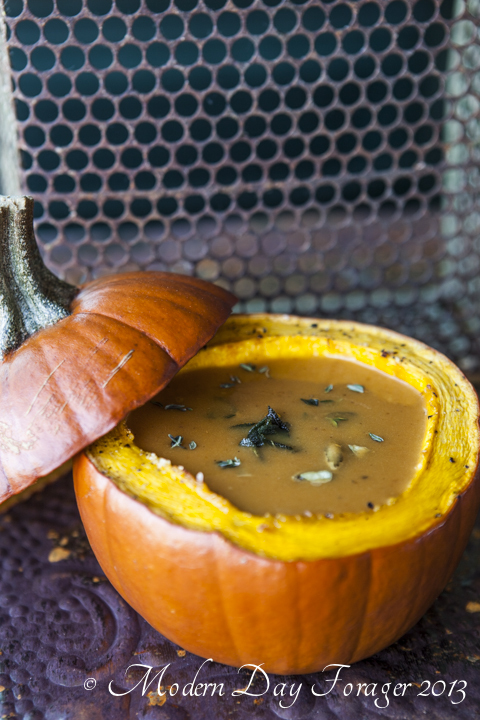 If it is very thick, add water 1/3 cup at a time until the brine is just thicker than a creamy salad dressing but no longer a sludge. Stir in the scallions and carrots. Drain the cabbage and add it to the brine. Though the kimchi will be tasty after 24 hours, it will be better in a week and at its prime in 2 weeks. It will still be good for another couple weeks after that, though it will grow stronger, and a little more sour and funkier. During this time we are re-charging our batteries, planning the rest of the years posts and hoping to make a few changes to the blog site itself. In the meantime, you can still follow us on Facebook and Twitter and we will see you soon. Well, this week has been an interesting one, here at MDF…who would have ever thought that the trials and tribulations would be so overwhelming with a little local blog? Every week we strive to bring the best we have to offer, blended with the best the valley has to offer, wrapped up in a pretty little package we call Modern Day Forager. A novice to the food styling and photography world, (“recipe dude”) as I am called, can tell you, this blog is no small undertaking. When I suggested ice cream as a theme, (in my infinite wisdom, I thought that ice cream in the valley of the sun, in the dead of summer, sounded like a great idea) my partners, to their credit, didn’t bat an eye. First up, was our chocolate stout ice cream, now my new favorite, because of it is rich chocolaty taste and creaminess. For me, it coated my mouth in all of the right places and but had a slight bitter hoppy finish that lingered, which is just how I like my beer. Next, we tackled Traci’s grown up take on the old-fashioned ice cream float. The flavors were inspired by a close friend, brew master and Master Cicerone Brian Helton’s house made chocolate stout, that we tried about a year ago and still talk about to this day. 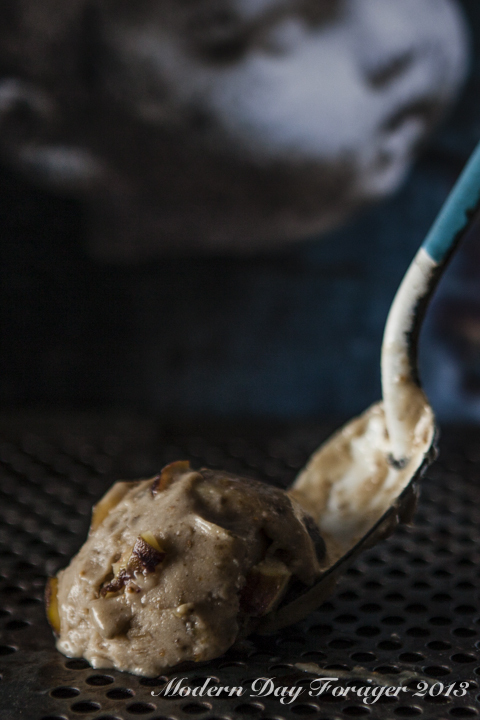 Number two on the list, was our figgy ice cream; we chose this one to bring one of our favorite fruits to the table and use the fig all the way from beginning to end. In order to really bring out the fruits flavor we incorporated AZ Bitters Lab Figgy Pudding bitters and to fully appreciate the texture we added even more fresh figs for their seediness and complexity. Bitters in ice cream, come on, oh yes, we did!!! Number three, and our final ice cream was, pink peppercorn goat cheese. We had to bring a savory ice cream into the mix that really exemplifies one of the things we like to do at urban table. The goat cheese brings a mild delicate creaminess with a whole lot of tang, while the pink peppercorns bring a very slight peppery finish with the addition of floral notes. We couldn’t just leave it alone, we had to push it a little farther, so we stirred in pieces of honey comb and drizzled honey in the batch for just the right amount of sweet and savory, it really pushed the boundaries and it became a winning combination for us. To finish up this theme of ours, Heather took over the writing reins and shop girl, to introduced us to an old school ice cream machine, reminiscent of one she used as a child. 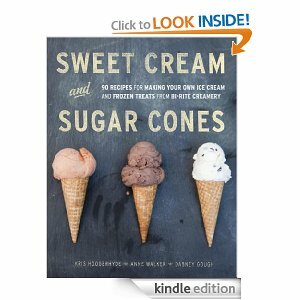 She shared the two books we read in preparation for ice cream week, both of which are great resources, (I am a big fan of the Humphry Slocombe book and took inspiration from it when writing the recipes), and finally she gave us a link to Joy cones, the perfect cone for our chocolate stout ice cream. We sure hope you enjoyed this as much as we did! 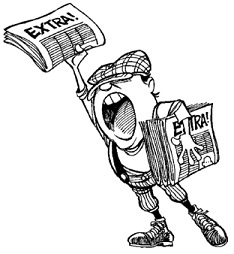 Please send us your feed back here or on our facebook page. As we wrap up our week of ice cream we wanted to give you a few things we love for making this wonderful treat. Memories come flooding back about summers of our youth. 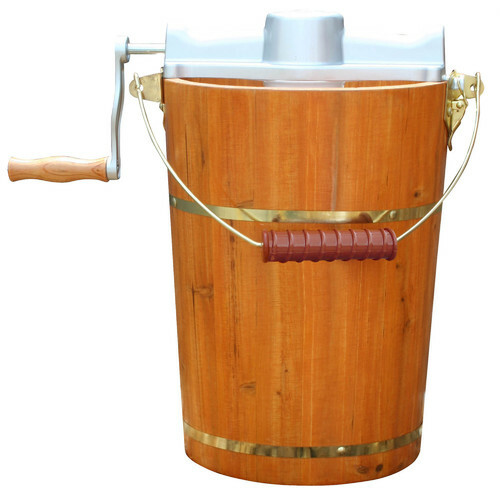 Many a summer was spent gathering up supplies to make our fresh churned ice cream. Boring but was always the favorite, vanilla. Sometimes adding miniature chocolate chips. It was never super hard and would melt very fast on a hot summer day. It always seemed at the time to take forever to make it, adding the crushed ice around the outside of the aluminum freezer. Adding rock salt to help it melt and then adding more. We found this on Wayfair. There are many newer and less labor intensive models to choose from but this reminds me of what we used growing up. This is sure to add many wonderful memories for you and your family. 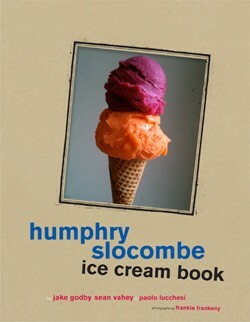 If you need inspiration about what flavor of ice cream to start with, we would like to suggest a few books on ice cream. Not only are the photos fun to look at but the recipes are delicious as well! 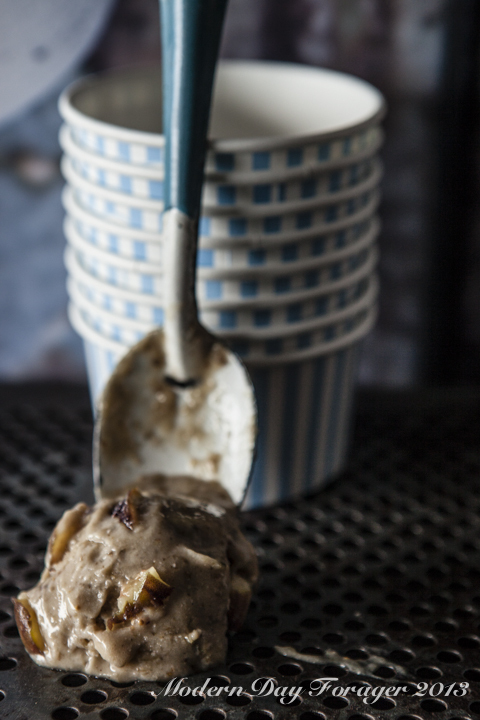 If you want to jazz up your homemade ice cream offerings you can get fancy with what you serve it in. We love pretzel cones. 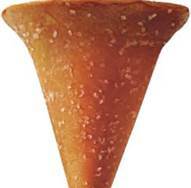 The Chocolate Stout Ice Cream would be so wonderful in these cones. There are so many special memories about ice cream for us. I can remember visiting grandpa and him making peppermint ice cream. He would take the giant candy canes and smash bits of it to add to the sweet vanilla cream. I haven’t had anything like it since. We would love to hear about your ice cream memories.